The Franklite Artemis Double Wall Light is in a Bronze finish with crystal glass sconces and transparent gold candle shades. The Franklite Artemis Wall Light is in a Chrome finish with crystal glass sconces and transparent silver candle shades. The Kolarz Ascot 0195.62L.4 is in an antique brass finish with Murano glass detailing and cream shade. The Elstead Balance Single Wall Light is a modern wall light in a Brown and Polished Brass finish with a bottom diffuser. The Elstead Balance Single Wall Light is a modern wall light in a White and Polished Nickel finish with a bottom diffuser. The Elstead Cambridge Solid Brass Double Wall Light is in a Burnished Brass finish and is shown dressed with pleated Ivory cotton shades. The Kolarz Carmen 3234.62.3.W.KpT/aq70 is in gold with crystal drops, aqua blue drops and sconces and fabric shades. The Kolarz Carmen 3234.62.3.W.KpT/aq21 is in gold with crystal drops, aqua champagne drops and sconces and fabric shades. The Kolarz Carmen 3234.62.3.W.KpT/aq40 is in gold with crystal drops, aqua red drops and sconces and fabric shades. The Kolarz Carmen 3234.62.5.KoT is in chrome with Kolarz crystal balls and sconces and violet fabric shades. The Franklite Carousel Double Wall Light is a larger scale wall light in a Soft Bronze finish with crystal candle pans and pleated candle shades. The Franklite Carousel Double Wall Light is a larger scale wall light in a Chrome finish with crystal candle pans and pleated candle shades. The Franklite Desire Wall Light has a Cream thread shade which has a slight glisten when illuminated. The Elstead Dunhill Single Wall Light is in a Royal Bronze finish with an off-white pleated fabric shade. The Elstead Finsbury Park Single Wall Light is a traditional handmade wall light in a Polished Nickel finish, dressed with a candle shade. The Elstead Gotham Wall Light is in an Imperial Silver finish with a Black shade, giving a sophisticated look. The Franklite Hexx Double Wall Light is in a Chrome finish with square section arms and fabric shades. The Elstead Kingsley Single Wall Light is in a Silver Leaf finish with a dark ivory pleated fabric shade. The Elstead Lanza Double Wall Light is in an Oil Rubbed Bronze finish with strong, rectangular metalwork. The Franklite Lucera Wall Light is in a modern Satin Nickel finish with a translucent silver fabric shade. 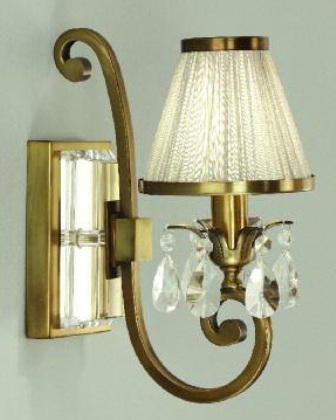 The Oaks Maita Double Wall Light is in an Antique Brass finish with crystal balls and fabric shades. The Kolarz Paralume Wall Light is in a Gold finish with a White shade, dressed with clear, violet and amber Swarovski crystals. The Franklite Petrushka Double Wall Light is a beautiful, elegant Bronze finish wall light dressed with transparent gold candle shades. The Franklite Petrushka Single Wall Light is a beautiful, elegant Chrome finish wall light with a transparent silver shade. The Elstead Pimlico Wall Light is in a Polished Nickel finish with fine cut glass droplets and sconces and pleated ivory candle shades. The Interiors 1900 Polina Single Wall Light is in a warm antique brass finish with crystal detailing and a beige fabric shade. The Interiors 1900 Polina Single Wall Light is in a modern nickel finish with crystal detailing and a beige fabric shade. The Elstead Sabina Wall Light is in a Silver Leaf finish with Distressed Gold varnish and eggshell silk shades. 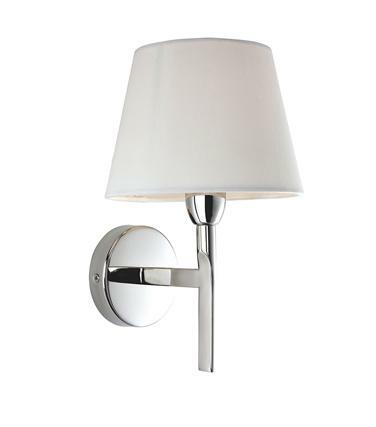 The Franklite WB987 Wall Light is in a Satin Nickel finish with an off-white fabric shade. 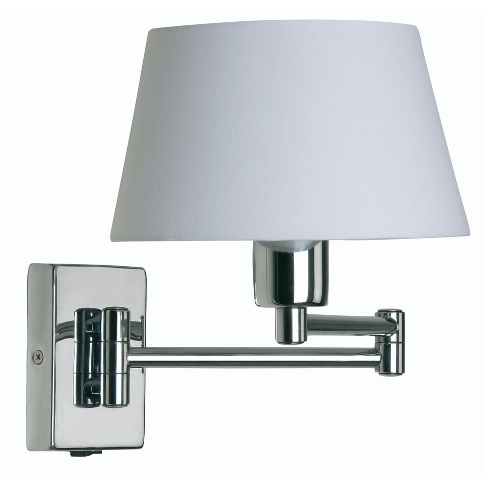 The Elstead Sussex Double Wall Light is in a Brushed Nickel finish with white fabric shades and clear glass columns. The Elstead Sussex Single Wall Light is in a Brushed Nickel finish with a white fabric shade and clear glass column. The Elstead Lighting Sutton Place Wall Light is in an Imperial Silver finish and is part of the Quoizel Uptown Collection. 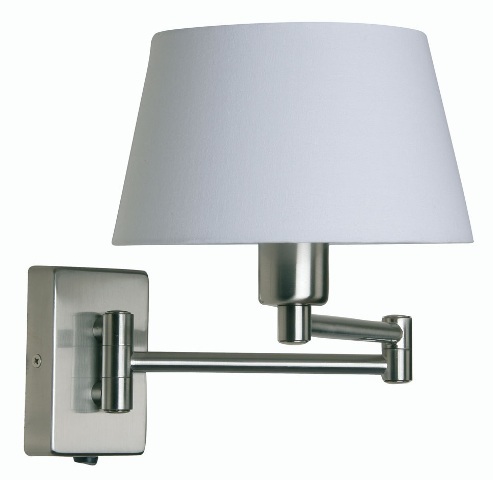 The Franklite Swing Arm Wall Light is in a Satin Nickel finish and is complete with cream shade. 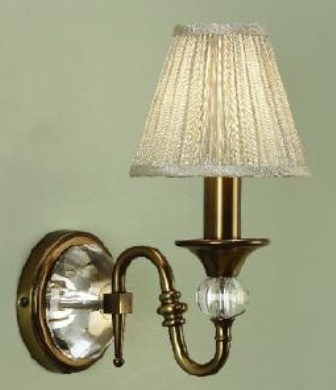 The Firstlight Transition Wall Light is in a Bronze finish with an oyster shade. The Firstlight Transition Wall Light is in a Polished Stainless Steel finish with a cream shade. 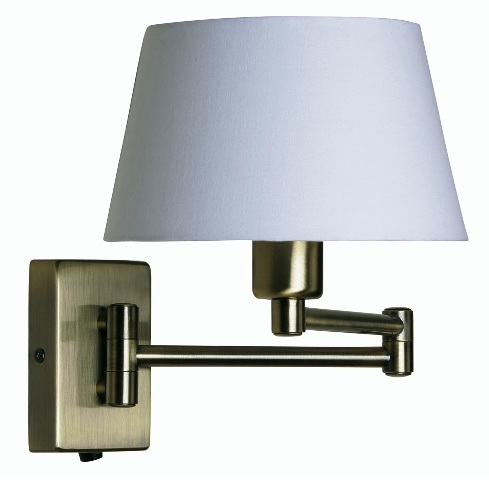 The Franklite Turin Double Wall Light is in a Chrome finish with cream fabric shades and a switch at the base. We offer a vast range of wall lights with fabric shades in many designs, sizes and finishes to suit you. Whether you are looking for a modern, contemporary or traditional wall light with fabric shade we are sure we have got one for you. Luxury Lighting are proud to supply this great selection of quality wall lights with fabric shades, we have styles to suit all budgets for all rooms in the home.